1. 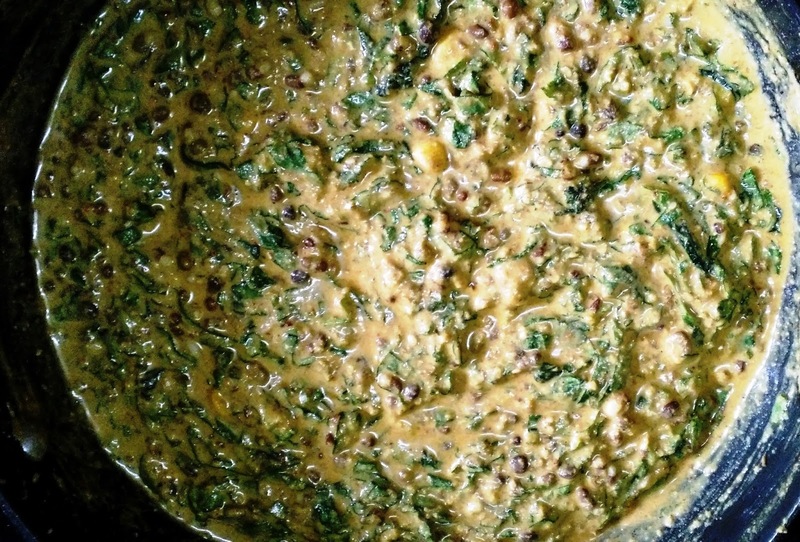 In a heavy bottom pan or kadhai add 3 tsp of desi ghee. 2. When ghee dissolves add suji in it & roast properly till it turns brownish red. You will come to know with its heavenly aroma. 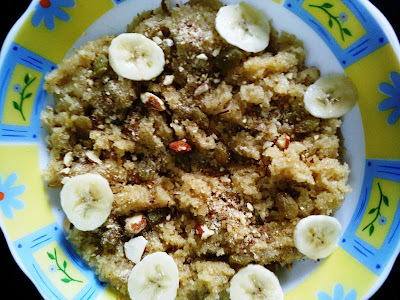 Add sliced banana & mix it in suji. save some slices for decoration. 3. On another gas stove boil water with jaggery & elaichi powder. 4. Add hot milk in that mixture & turn off the gas. 5.Pour this mixture into roasted suji. 7. At this stage add remaining 1 tsp ghee mix again properly & turn off the flame. 8. Let it covered for 5 minutes. 9. Garnish it with raisins, almond powder & banana slices & enjoy!! 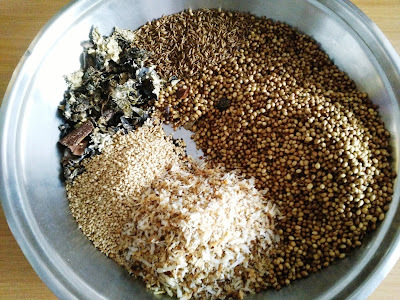 Goda masala is used in many maharastrian recipes such as stuffed baigan & many other veggies having gravies. Also for famous Masale bhat!!! Turmeric powder & red chili powder are optional. Roast all the ingredients in a heavy bottom pan by adding little oil. Add oil as per the quantity of ingredient. Do not over roast the ingredients as it affects the aroma of the masala. Roast till all the ingredients turn light brown. 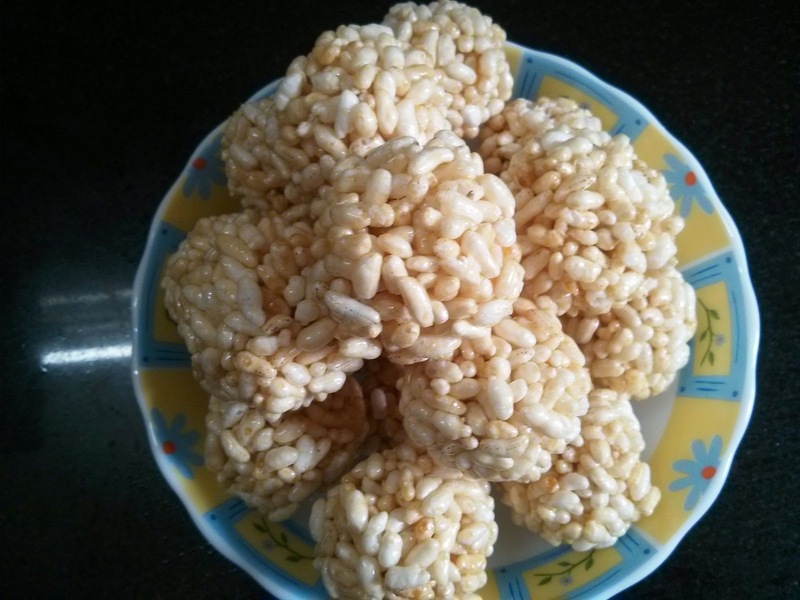 Dry roast sesame seeds & dry coconut. Do not roast turmeric powder & red chili powder if you want to add in masala. Mix all the ingredients properly. Let the mixture cool down. Grind in a mixer & preserve in airtight jar. It lasts more than year. This home made masala has very fresh & nice aroma. It takes only half an hour to prepare!! 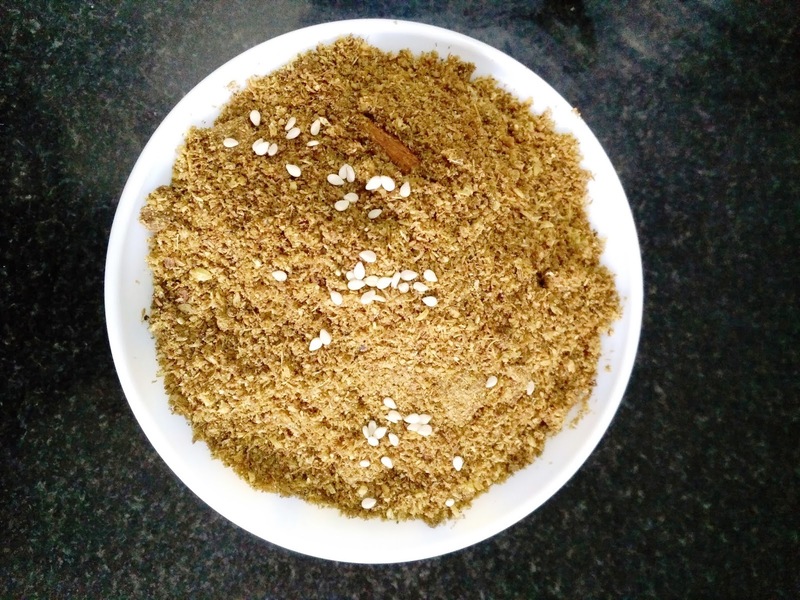 Dry roast all above ingredients separately in a heavy bottom pan or kadhai. Let them cool properly. Grind fine on mixer grinder. Let it cool. Preserve it in airtight jar. It can last up to one year if roasted properly. 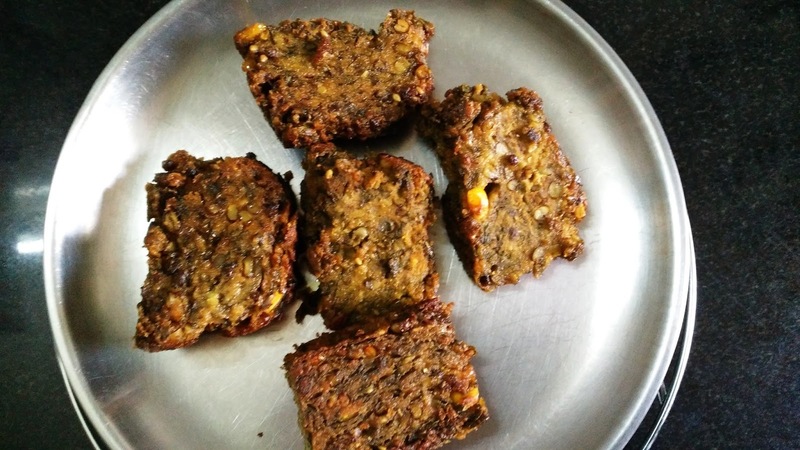 Enjoy delicious thalipith or baked bhajni wadi whenever you want!! We all prepare bhajni thalipith. It is one of the favorite & popular maharastrian recipe. I tried this recipe by adding some veggies & other ingredients .It turned out very tasty & healthy too!!! 1. Pressure cook all the sprouts to 2 whistles. 2. In a big bowl take thalipith bhajni & rice flour. 3. Add half cooked sprouts,chopped onion, carrot, spinach,sweet corn & boiled potato pieces. 4. 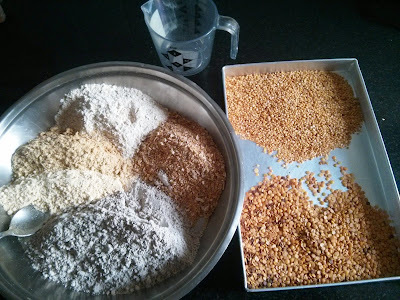 Add sesame seeds, green chili paste, red chili powder, turmeric powder, ajwain , salt, sugar & yogurt. 5. Mix well. Add water as required. consistency should be like cake batter. 6. Add olive oil. Add baking powder. 7. Grease the baking tin & pour the mixture into it. 8. Bake in the oven for about a hour at 180 C.
9. Cut into pieces as you like , shallow fry in a pan & enjoy !!! This is very healthy recipe for breakfast which can be substitute for the cereals we buy from the market!! We get proteins, carbohytrates, vitamins, fibres everything in this cereal in pure & natural form. Taste is enhanced with dry fruits & chopped fresh fruits. Ideal for adults as well as children!!!! 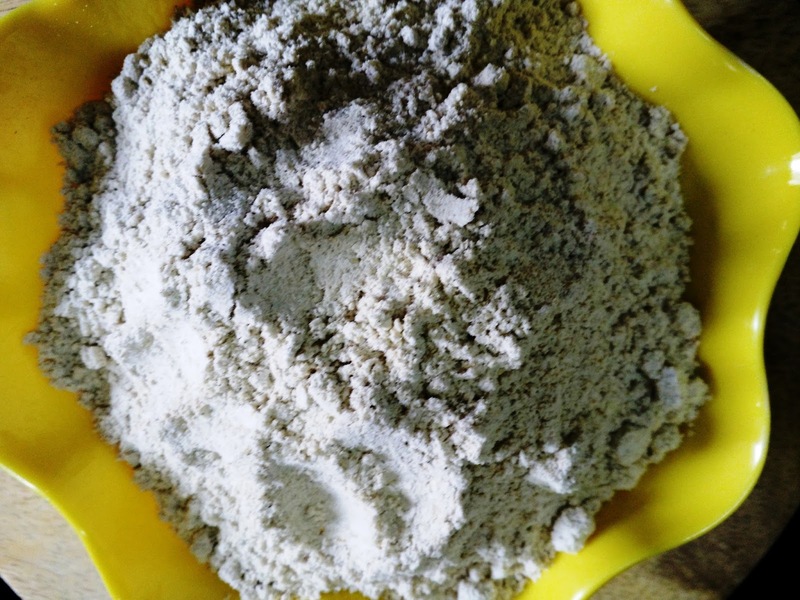 Dry roast ragi flour, Wheat flour, Soya bin flour each separately till turns little brown. Keep aside. Dry roast oats & grind to coarse powder. 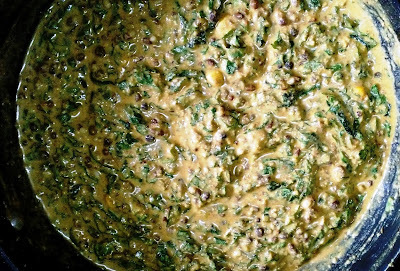 masoor dal separate till brown. Let them cool completely. After cooling grind them to fine powder. Roast dry dates pieces. After cooling grind them to powder. You can use the powder you get in the market. Add elaychi & jaiphal powder & again mix properly. Store this healthy cereal powder in a container. 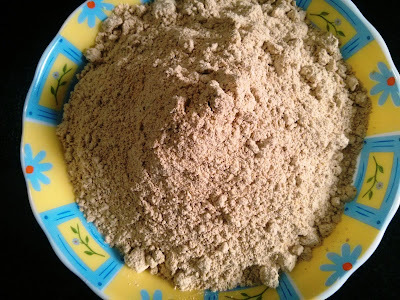 Take the required quantity ( 3-4 tbsp is enough for a person ) in a bowl. Add 1/2 cup of milk in the cereal. Mix & keep in the microwave oven for 30 seconds. Take the bowl out & again stir properly. Add 1/2 cup of milk & again microwave for 30 seconds. Your cereal is ready!! Add chopped almonds, walnuts, black raisins. Add some pieces of fresh fruits like banana, apple,peach whatever you like. Add sugar if more sweetness is required as per personal taste. If you do not have microwave oven, add hot milk in the cereal powder & stir properly as all the ingredients are roasted properly. 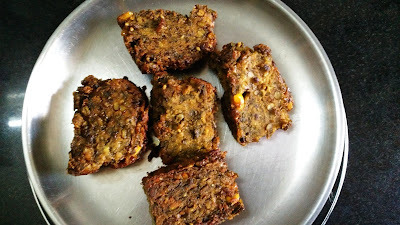 Then add dry fruits or fruits in it & enjoy!! Or add 2 tsp in a glass of hot milk along with some sugar & drink this instant energy milk!! 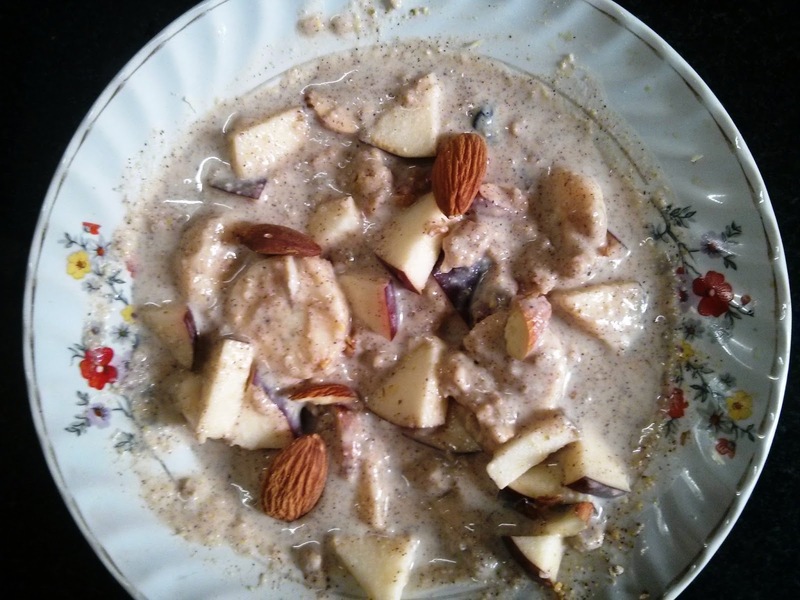 Enjoy this healthy cereal packed with all goodies & remain fresh & healthy!! !